With its sweeping desert vistas and graceful historic buildings, Tucson is known for its distinctive sense of place. Its complex mix of culinary traditions also creates a distinctive sense of taste—one that helped earn Tucson a designation by UNESCO as the first City of Gastronomy in the United States. Here’s a nice surprise: Three top visitor attractions allow you to experience the city’s outstanding settings and its outstanding dining at the same time. “Zoo” and “cuisine” are rarely mentioned in the same sentence, but the Arizona-Sonora Desert Museum is not your typical critter showcase. For one thing, rather than highlighting plant and animal species from disparate sections of the globe, this 98-acre exhibition space focuses entirely on the flora and fauna of the Sonoran Desert. In addition to interpreting the living land and waterscapes shared by Arizona and the Mexican state of Sonora—an aquarium acts as a reminder that the Sea of Cortez is part of the region’s ecology—the Desert Museum explores the area’s natural history with a dazzling array of minerals and rocks, drawing geology buffs from around the world. Although cacti and other prickly plants don’t lend themselves to petting, visitors have plenty of ways to interact with various environments: stroking the scaly charge of a snake-handling docent, say, or strolling through a flower-filled aviary where jewel-toned hummingbirds flit around freely. 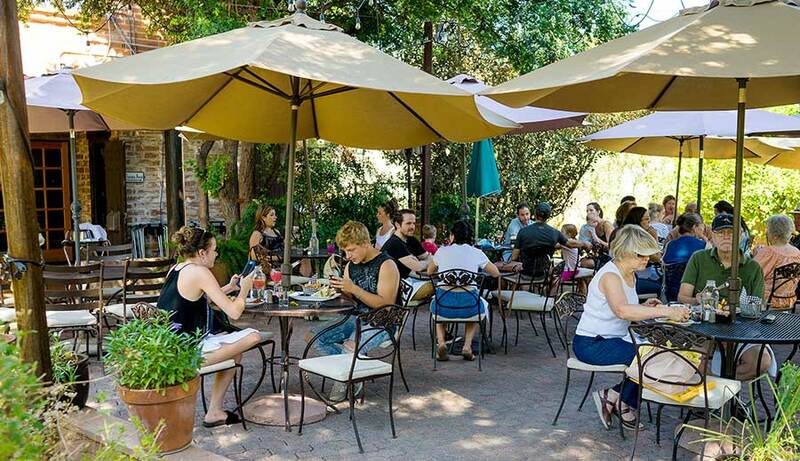 And at the Desert Museum’s two main dining venues, you can literally savor the region’s flavors. The more upscale Ocotillo Cafe encapsulates Southwest aesthetics, from purple napkins that echo the lavender and sage in the terrace garden to the quote from local Tohono O’odham poet Ofelia Zepeda on the entryway wall. For a sampler of menu highlights, don’t miss the bocadillo board, featuring tepary-bean hummus, Spanish chorizo, house-smoked chicharrones, local cheeses, glazed pepita seeds, dried fruits, and pickled vegetables. The grilled carnitas and green chiles sandwich does a local spin on the classic Cubano, while the chicken Azteca blends seasonal vegetables, pasilla chiles, Oaxacan cheese, cilantro, and lime in a piquant tomato broth. And at the Desert Museum’s two main dining venues, you can literally savor the region’s flavors. Offering more casual counter service, the Ironwood Terrace also provides a cross-border experience. You’ll find a variety of tamales, tacos, and quesadillas at the Agave food station, and you can choose your favorite filling and salsa to enfold in a flour or corn tortilla. Familiar kiddie chow such as hamburgers gives a nod to a different regional tradition by using only Arizona-sourced beef for the patties. Sitting on 49 cactus-studded acres on Tucson’s northwest side, Tohono Chul is closer to the city center than the Desert Museum, but you’d never know it from the serenity of its nature trails or the proximity of the Santa Catalinas, which provide a dramatic mountain backdrop. The Hohokam people settled this swath of land more than 1,000 years ago; citrus and date palm growers took advantage of its mild winter microclimate in the 1920s; and a succession of families who appreciated the aesthetics of desert living built homes here from the 1940s to the 1960s. The nature preserve that was established on the land in 1985 pays homage to all these historical phases—starting with the name Tohono Chul, which means “desert corner” in the language of the Tohono O’odham people, successors of the Hohokam. But perhaps it is the repurposed residence of John Sullivan, built in 1963, that best embodies how past and present come together here. The Spanish hacienda-style home now hosts the Garden Bistro, notable both for its architecture and for the menu’s reliance on fresh ingredients plucked from the park’s Heritage Garden (also called the Ethnobotanical Garden). Indigenous fruits and vegetables traditionally cultivated by Native Americans mingle with plant species brought over by European settlers centuries later. A large arched doorway and traditional zaguan (covered breezeway) lead to three dining areas: an outdoor back patio, looking out over a patch of unmanicured desert; the interior courtyard, centered by an ornate fountain; and several art-filled interior rooms with white tablecloths. All of them are appealing, though the weather might dictate your decision on where to sit. Unfettered by anything but the size of your appetite, you might have a harder time deciding which dishes to order. Popular picks include the huevos rancheros, two eggs served with Native American fry bread, calabacitas (a melange of squash, corn, and chile), and chorizo or sausage. The chicken & waffles get a Southwest spin: The crispy chicken breast is glazed with chiltepin-mesquite honey, the waffles are made with blue corn and green chiles, and the seasonal melon (maybe a Hopi casaba) comes spiced with Mexican tajin spice. Bottomless prickly pear margaritas and mimosas—served every day, not just for the weekend brunch—provide a different kind of Southwest kick. Bottomless prickly pear margaritas and mimosas provide a Southwest kick. At Cafe a la C’art, you’ll find a longer, more cosmopolitan cocktail list and an elegant dinner menu, in addition to more casual breakfast, lunch, and brunch options. Of course, you’d expect sophistication in a restaurant that’s part of the Tucson Museum of Art and Historic Block. The movers and shakers of early Tucson flocked to this 1860s home built by Hiram Stevens, a respected businessman and Territorial legislator. He and his wife, Petra Santa Cruz, a descendant of early Spanish settlers, entertained here in grand style. The Stevens House still hosts movers and shakers—its proximity to downtown law offices and government buildings makes Cafe a la C’art a magnet for attorneys and politicians—as well as visitors to the world-class exhibitions at the art museum. The restaurant itself is a feast for the eyes. Work from the prestigious Etherton Gallery hangs on the walls of a series of intimate rooms with gleaming hardwood floors, while the vine-draped covered patio, its tables set next to colorful mosaic banquettes, sparkles with tiny lights after dark. When the Chocolate Bomb is sold out, some of the most civilized people go a bit feral. It is the artful New American fare that’s the biggest draw, however. The menus change seasonally, but at dinner you might find Southern comfort with shrimp and grits, the blackened crustaceans sided by polenta laced with goat cheese, pickled okra, and peppadew relish. A crossover menu staple—you can get it at lunch, brunch, or dinner times—the Cafe Burger is topped with pepper Jack, avocado, chipotle aioli, and applewood bacon. Creative salads and quiches are crowd-pleasers, too. But many patrons just cut straight to the chase and make a beeline for the vintage pastry case. Cookies, scones, layer cakes, cheesecake squares, fruit tarts, cream pies … you never know what form these confections will take. One exception is the signature Chocolate Bomb, a triple-threat combination of chocolate cake, chocolate ganache, and chocolate mousse that is always on offer. Forget the artful setting. When the Chocolate Bomb is sold out, some of the most civilized people go a bit feral.